Got the first 3 units finished. All looking a little samey, so I’m going to try a base of boar boyz and some light units next to break things up. Just got to wait for the glue to set on the boars and somehow come up with a way to do archers. Not a huge fan of the rocky outcrops, so that’s the last you’ll see of them. 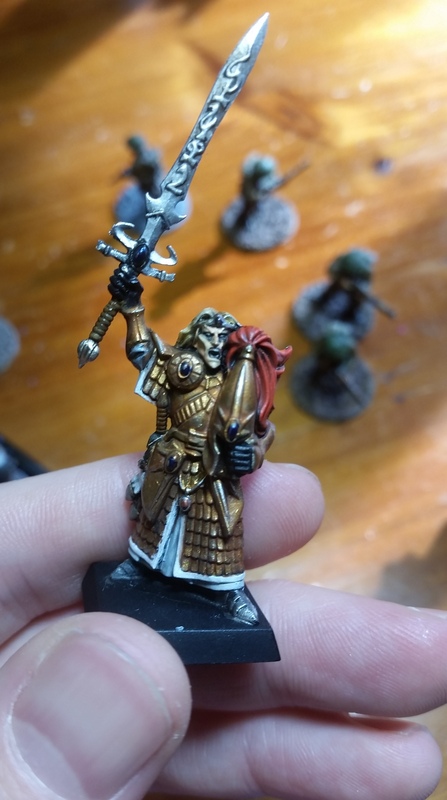 For anyone interested in ancients, I’m pretty sure that if you paint them with flesh tones instead of green you’ll end up with any barbarian horde you care to mention from history. Author revengeoftheiceniPosted on 03/10/2017 03/10/2017 Tags 2mm, Dragon Rampant, OrcsLeave a comment on Three down. I decided to go with making up an orc base first simply because it will give me a bit more time to figure out proper ancient formations. A bit more tweaking with the colours and some work on the base is still needed. 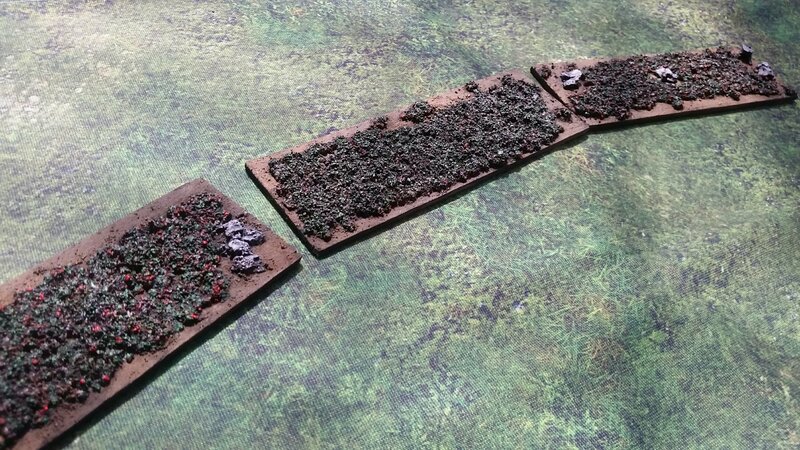 The others have rocky outcrops on them, which helps a bit. The idea will be they’re attacking a dwarf stronghold up in the moutains. 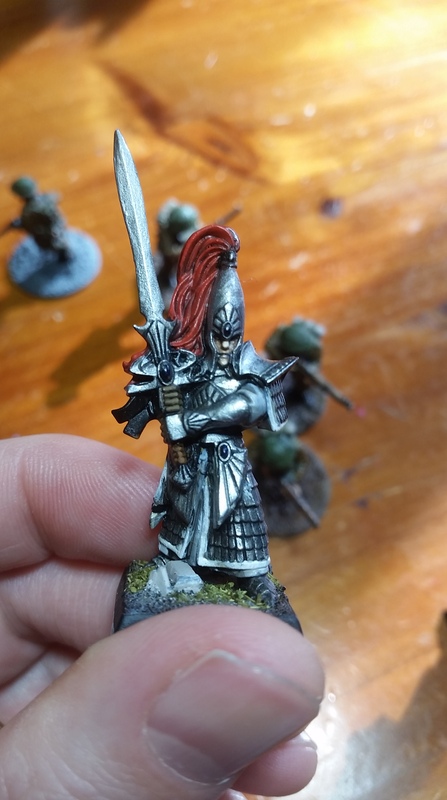 I can do a base of trollslayers as part of the opposing army that way. I have been trying to think of a good/easy way to do squigs. It’s going to take a fair bit of sculpting, so my laziness may well insure they never see the light of day. They seem like a better way to go than boar boyz – the tests for them haven’t been impressive. Anyway, the first 10,000 orcs are almost done. 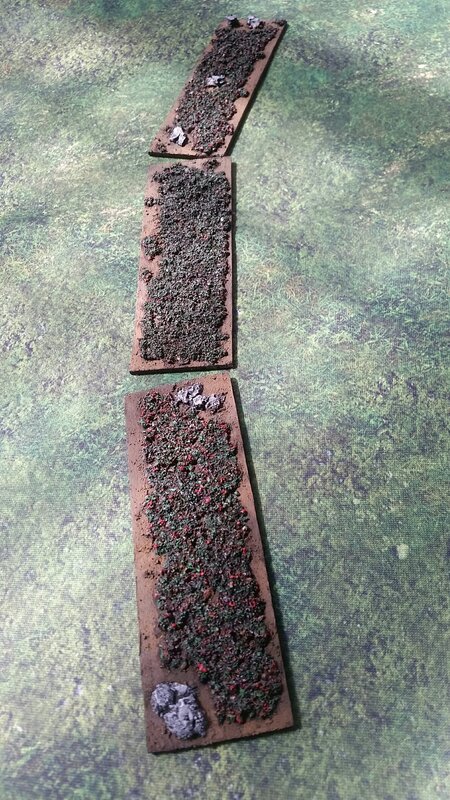 Author revengeoftheiceniPosted on 27/09/2017 27/09/2017 Tags 2mm, Dragon Rampant, OrcsLeave a comment on First test base. Now, I love what Mark has done and had funnily enough been looking at the available 2mm figures around the same time that I saw his posts on Twitter. The only issue is that I can’t sculpt, so could I come up with something that looks similar without having to crack out the green stuff? I thought if I could find something with small enough grains and more irregularity than sand, there may be a chance I could bypass all the hard work and knock out something that looks like thousands of people standing in a field relatively easily. 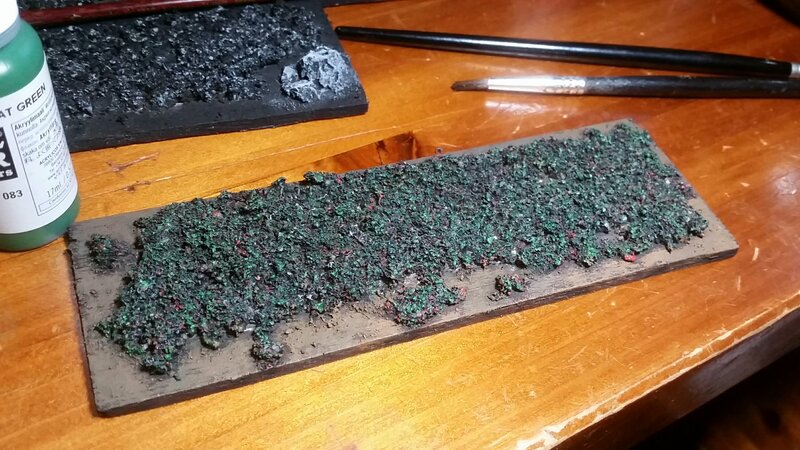 As crazy as it sounds, drying out used tea leaves and sticking them to a base results in a pretty realistic looking horde of hairy barbarians or mob of whatever ancient army you care to play with. This is the test piece I produced to try out various formations. In the interest of total disclosure, I have next to no knowledge of how ancient armies fought and have only ever played Command and Colours for this period, so the number of ranks and pretty much everything else won’t be correct. But then that’s where you can do your thing and line them up exactly as you see historical fit. The method is idiot proof in a way that can only be devised by an idiot. 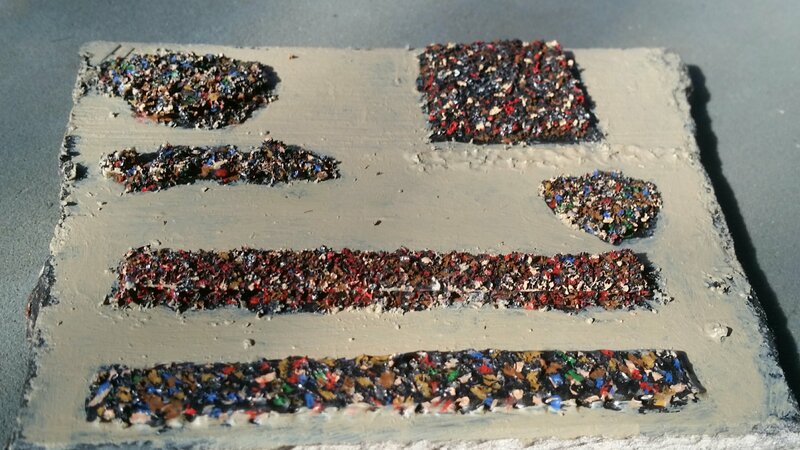 First, either cut a piece of 2mm cardboard to the required shape or glue small aquarium stones in a blob for hordes. 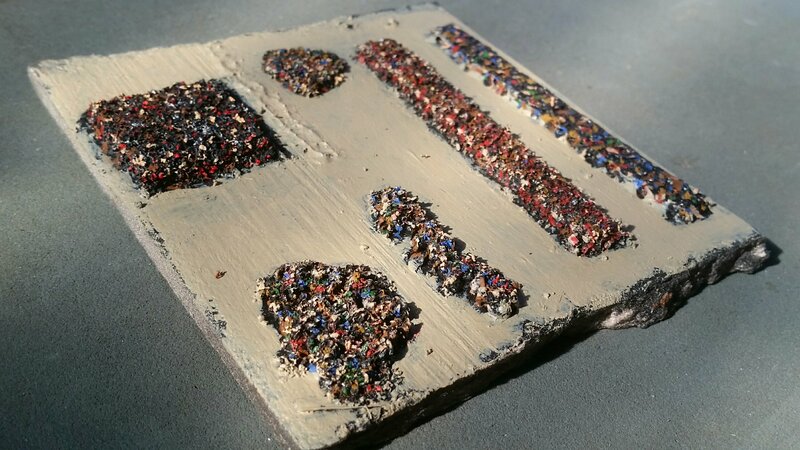 Next, carefully paint on PVA and sprinkle on the dried tea leaves. 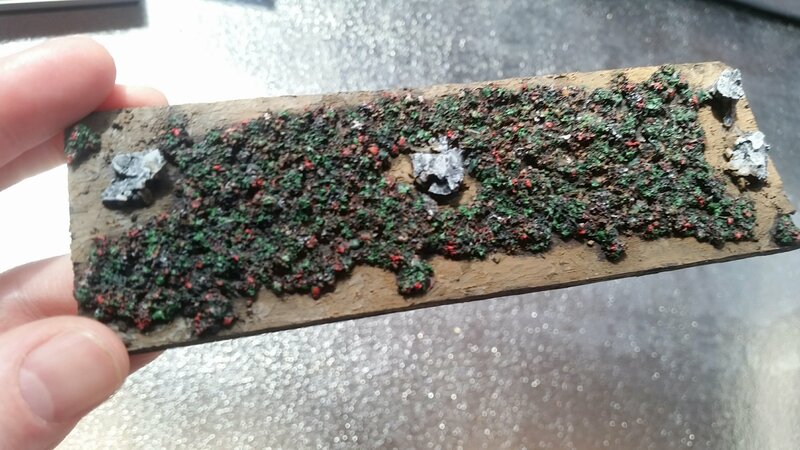 Seal it with some watered down PVA and prime it black. Once you’ve done that you can paint the units up however you like and differentiate between troup types by making elite troups look more uniform and your average Iceni less so. The one issue is going to be cavalry and chariots. I’ve got idea on how I might be able to trick the eye with them, but need to test it out first. Skirmishers are also going to be a big problem, but there should be a way to approximate them. The other thing is could it work for Napoleonics? 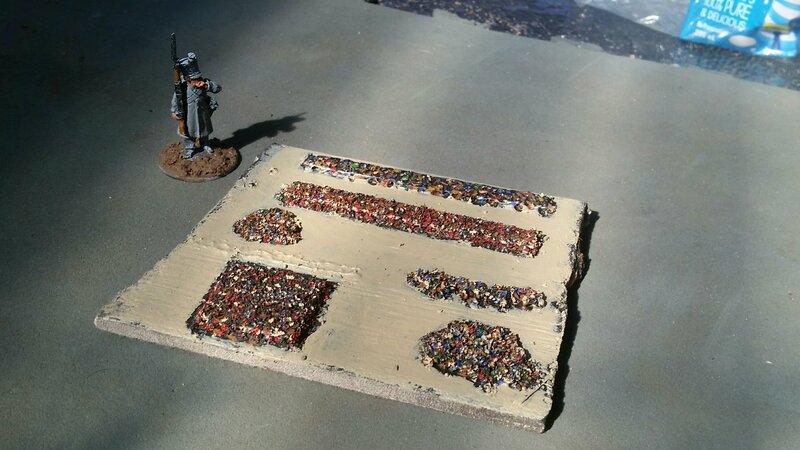 It would give a fantastic sense of the size of the armies involved which the other scales just don’t do for me. Here my shameful lack of knowledge on the subject lets me down again. I think the British fought in two ranks, which would be a very thin red line at this scale. Still, squares might look great, as could units marching in column. I’m going to keep on experimenting to see if it’s possible to make it work. 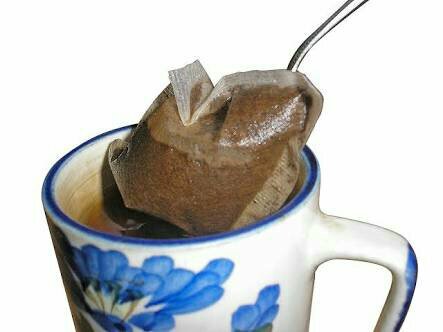 I did try using Vallejo Plastic Putty instead of the tea, but I found the results weren’t anything like as good. 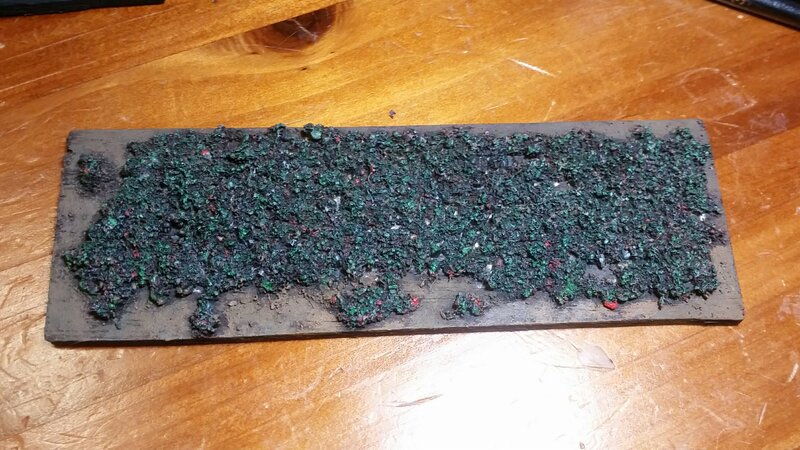 The unit at the very bottom of the test piece was done this way and the level of texture to paint on is much poorer. I also need to work on my colour choices, but, otherwise, I think there could be some fun to be had messing around with this. It’s not like I’m short of used tea bags and nappy boxes to chop up and there is something strangely statisfying about creating tens of thousands of bodies in a matter of minutes. It could also work for Dragon Rampant and give you huge waves of orcs to play with. And with big bases you could fill a 6′ x 4′ with no problems at all. There’s a lot of possibilities, especially when you add scenery to the mix. Going to order some MDF bases next and see what I can come up with. Just a quick update on the skirmish warband I’m putting together for either Dragon Rampant or AOS Skirmish. 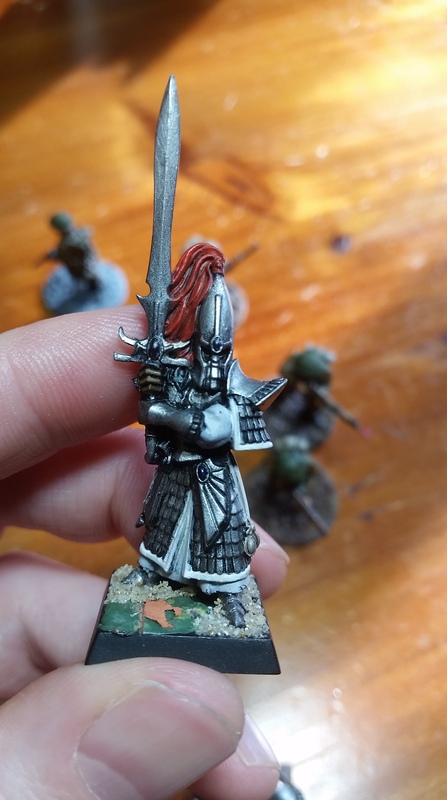 Had these High Elves hanging around for years and never thought I put paint on them. Still a little bit more to do, but they should look ok when they’re rebased and on the table. 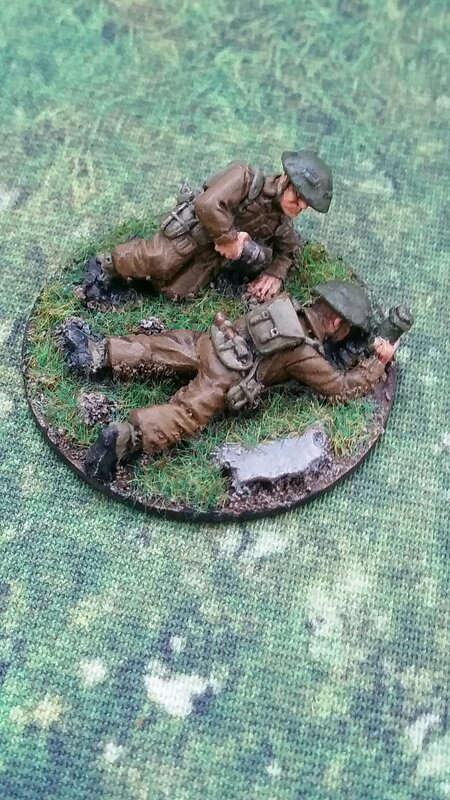 I struggled to find many pictures of Blacktree’s Second World War figures before jumping onto one of their sales and thought putting a few photos up here of what you can expect might come in handy. They’re generally pretty good figures with only the occasional one looking a bit too ape-like. One thing you do need to be aware of is that a few of the figures in the range do have some pretty nasty mould lines running across their faces and there’s not much that can be done to remove them without taking out a far bit if the detail they cross. Oherwise, they’re not bad models at all and paint up really easily. I’ll try to post a few more once I finally get round to painting them because you really can’t tell what you’re getting from the website at all.